Dr. Burny Baxter Performs A Lameness Exam At The Clinic. 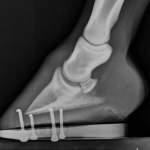 Diagnosing and treating equine lameness is one of the most challenging practices facing your equine veterinarian today. For horse owners, it can be one of the most frustrating. This is because finding the cause of your horse’s lameness can be like finding a needle in a haystack. Our commitment to continuing education allows us to practice with state of the art knowledge and diagnostics, giving your horse the best hope for soundness. 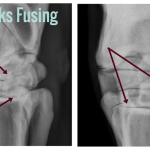 Your horse’s lameness exam often resembles trying to solve a puzzle. Achieving the goal, in solving the puzzle, and therefore the lameness depends on an accurate diagnosis. 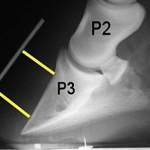 Though this sounds elementary, in practice lameness problems can be difficult to pinpoint and can take a significant amount of time and patience. With a detailed history, the exam often begins with trotting on a lead in a straight line and at times on different types of surfaces. We like to see the horse longed in a circle as this places torque on the legs and often makes the lameness stand out more clearly. On occasion, we need to see the horse ridden so it’s very important to have your tack available at the time of the exam just in case this is needed. 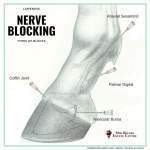 As mentioned before, the key to solving lameness issues is a methodical approach with an accurate history of the problem coupled with systematic list of tests and diagnostic regional anesthetic blocks. 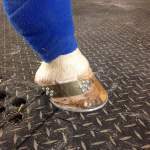 We begin with hoof testers and a general palpation of the leg structures. We proceed with flexion tests and a cursory review of acupuncture sensory points, continuing the exam with regional anesthetic blocks. By anesthetic blocks, we are referring to local injections of an anesthetic such as lidocaine, which will block sensation to a very specific area. 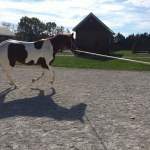 By doing so, the area creating the problem can be temporarily desensitized, and with the pain removed, the horses gait will generally return to normal. Together these examination components give an idea as to the general nature and location of the problem. 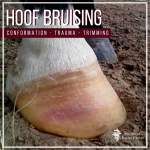 One very important concept to remember is traumatic skin wounds will generally not cause enough discomfort to create lameness. 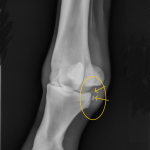 In instances such as these, lameness should alert you to the involvement of a deeper more important structure such as a joint or a tendon sheath. Do not delay in getting medical attention for lameness problems when associated with a wound. Time may not be on your side! 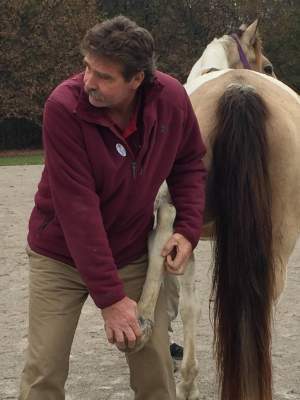 The reasons for a horse’s lameness are various, and so are the treatments. All horses seen for a lameness issue will have a treatment program tailored for them based on the lameness diagnosis and the health history of the horse. Treatments include, but are not limited to, Stem Cell Therapy, Microscopic Laser Surgery, Arthoscopic Surgery, Anti-Inflammatory Therapy, Antibiotics, Joint Medications, Joint Lavage, and Casts. Alternative therapies may also be employed include Acupuncture, Cold Laser Therapy, Ultrasound, and Heat Therapy.